How to Make Great and Eco-Friendly Halloween Masks | TonerGreen - Eco-Friendly Toners from the U.S.
Halloween is almost here and we all know it so maybe some of you are already so hyped in preparing for this annual event. It would be great to buy your costumes and props, but it would actually be best to try creating your own masks or decors. Let TonerGreen help you with our tips here on how to create greate Halloween masks plus you instantly become greener too! 1. 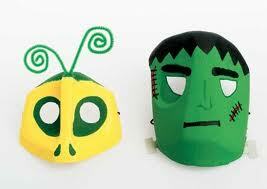 There are websites that offer different Halloween masks designs. You can check those like Free Halloween Masks and Fantasy Jr. or create your own unique design by drafting it then scanning to have your design on your desktop. Add the details that you want on your mask. 2. Now, it’s time to print your mask but be sure that you have the right tips on how to become eco-friendly in printing. When your mask is filled with colors, use a thick kind of paper so that it will quickly absorb the ink or toner and it can last longer too. Also keep in mind to use only remanufactured printer cartridges because this is the key to being eco-friendly on your printing. So you have all the necessary tips to make your Halloween closer to your heart this year because you can easily make your own mask and you will even help the environment too. But wait, TonerGreen has a lot more treats for you this Halloween so stay updated here for our next greener Halloween tips.